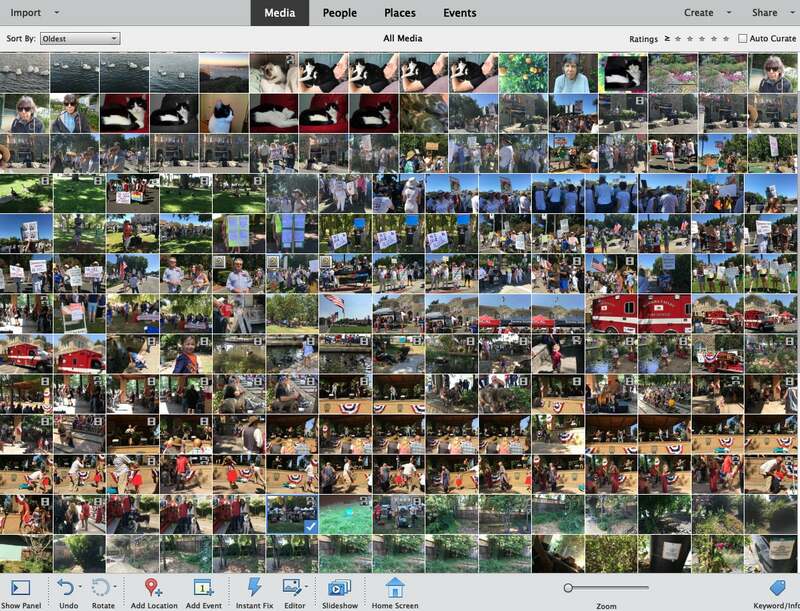 If you are the designated family memoirist, you can count on Adobe Photoshop Elements 2019 to give your run-of-the-mill photos a bit of a kick. The latest version of 2019 vintage does a good job of augmenting automated aspects of the program while giving the opening sequence a fresh coat of paint. 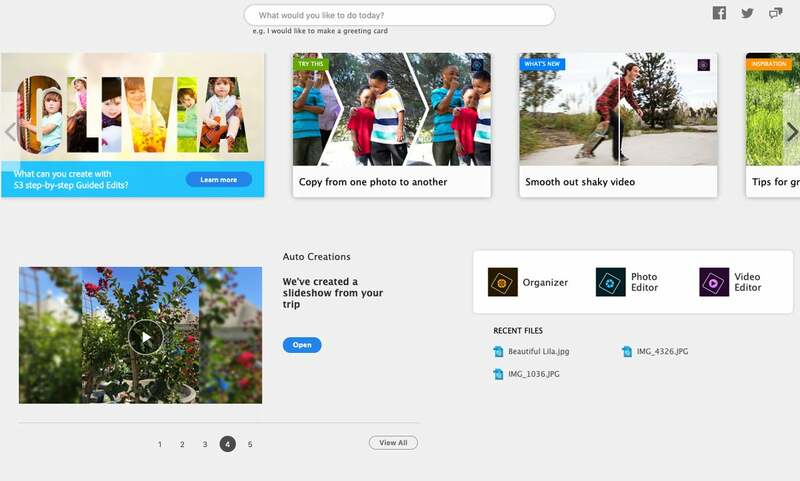 Increasingly, Adobe’s creative apps rely on Adobe Sensei, the company’s artificial intelligence engine and the first thing you’ll notice when launching Photoshop Elements 2019 is the brand-new Home Screen. 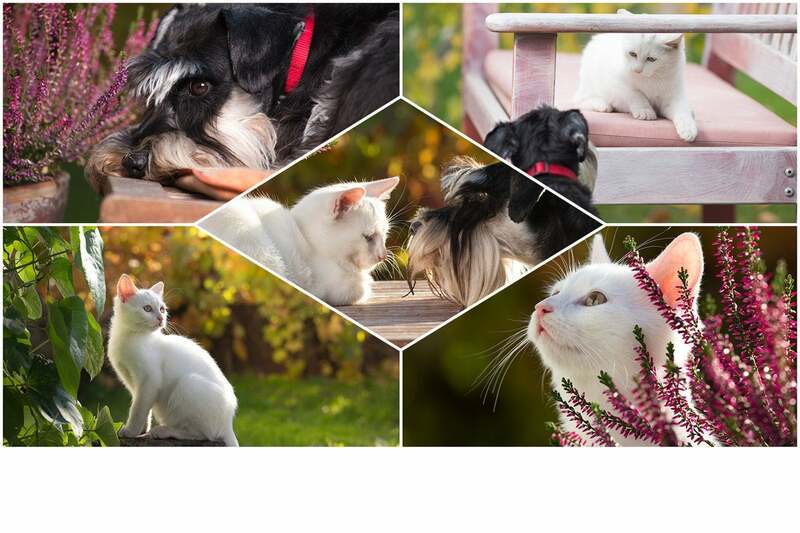 This light, airy window into the Elements world presents you with the new Auto Creations feature, a series of photo and video collages and slideshows generated from the content you added to the Elements Organizer. There’s nothing obviously new in Elements Organizer land. While Organizer, the asset management helper app for both Photoshop Elements and Premiere Elements, got no identifiable new features per se, it hooks into the app’s auto creation functionality. With the 2019 version, Elements now supports the highly compressed HEIF (High Efficiency Image File) and HEVC (High Efficiency Video Coding) image and video formats, used by iPhone 7 and later. Adobe tops off the new features with four additional guided edits, the app’s step-by-step guide to photographic special effects. As you delve into the app, you’ll see two program icons in your dock-the Home Screen and the Editor. Adobe says this lets users always access the app’s Home Screen without having to navigate to it. The new Home Screen lets you access most of the Photoshop Elements app and the new Auto Creations function. 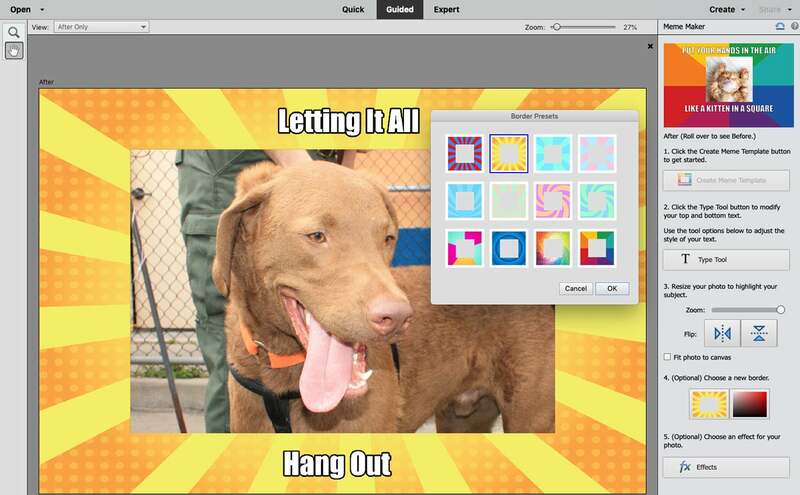 When you launch Photoshop Elements’ Home Screen, you see a listing of guided edits, and at the bottom left, a series of auto-generated photo and video slideshows and collages. Each is a finished product, but there’s plenty of room to use the revamped collage generator to tweak in any way you want. Just click on the collage of your choice and then use the new templates to change the pattern, or move and swap photos around until you’re happy with the result. Photo collages specifically designed for Instagram and Facebook let you expedite social media posting. Guided edits are Adobe Elements’ signature feature, and each year new recipes are added to the roster. Four new guides show you how to load images into text, transform a photo into a partial sketch, create a new meme, and place elegant borders and annotations around your photo. These intelligent features are exceptionally easy to use with only a few steps necessary to give your pictures a whole new look. Multi Photo Text. What is it about stuffing images into lettering? Whatever it is, people love it. In this version, you can place a separate picture into each letter. You also get a choice of transparent, fill color, or image background and various text styles. 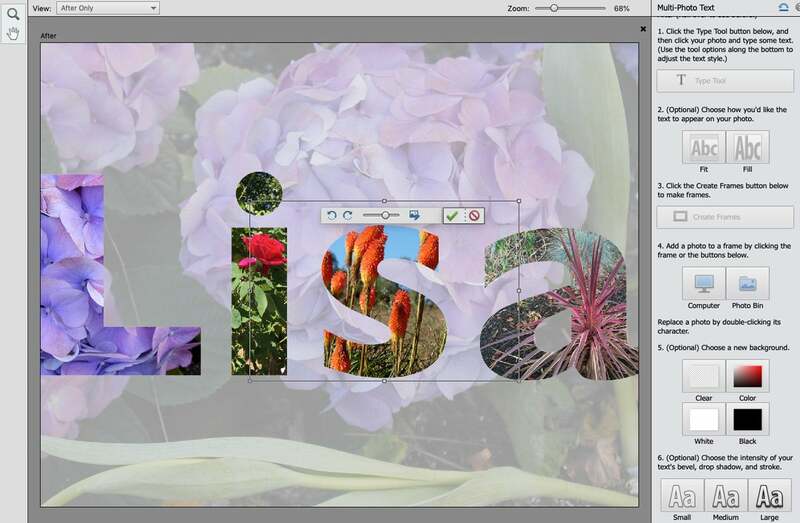 Fill each letter with a different picture on top of an image background. Memes. Photoshop Elements knows and loves memes, and this year, the new version offers yet another meme you can create in just a couple of clicks. Different borders and image styles adorn your memes. Text and Border Overlay. This extremely elegant and easy-to-use edit places a professional looking border around your image, and lets you commemorate it with a small bit of text. It makes any memorable day stand out, especially when framed on your mantle. Several border and text choices are available, but more would be optimal. The tool is a little restrictive in that you must go strictly in sequence and cannot back up once you have decided on text or a border. You also cannot change the size or positioning of the text beyond the few offered choices. 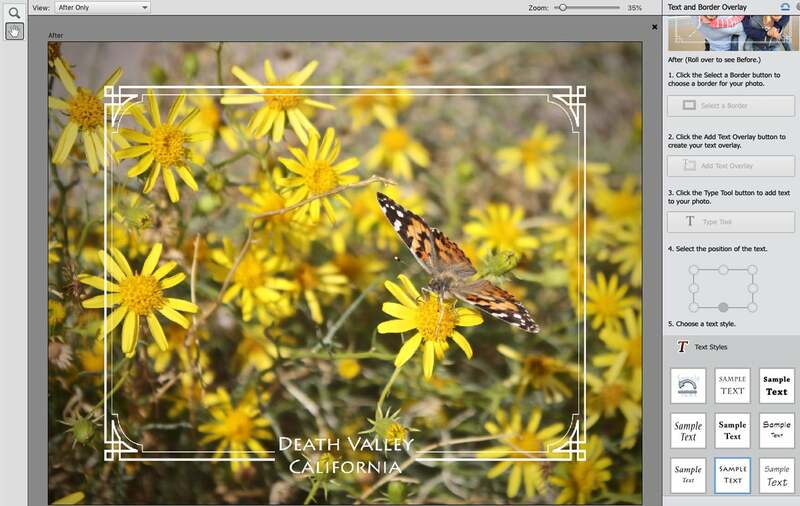 Elegant border overlays and commemorative text highlight your favorite images. Partial Sketch. Sometimes you want to put a little variety into your snapshots. One way is to create a special effect that’s part drawing and part photo. Photoshop Elements gives you four choices: pencil, colored pencil, old paper, and old photo. You can select and place these effects anywhere in your image, and experiment until you’re happy with the result. Sadly, you can’t mix two or more effects together in the same image though you can cycle through each effect and do various adjustments to opacity and brush size. You have several choices in how to transform your images into mixed media creations. There’s not much to complain about with Adobe Photoshop Elements 2019. It would be nice if the new Home Screen could be resized. More patterns for memes and the ability to mix partial sketch styles would be nice, but most consumers will like the new guided edits just as they are. And with 2019, all users must have an Adobe ID and sign in with an Adobe ID and password to use the app. 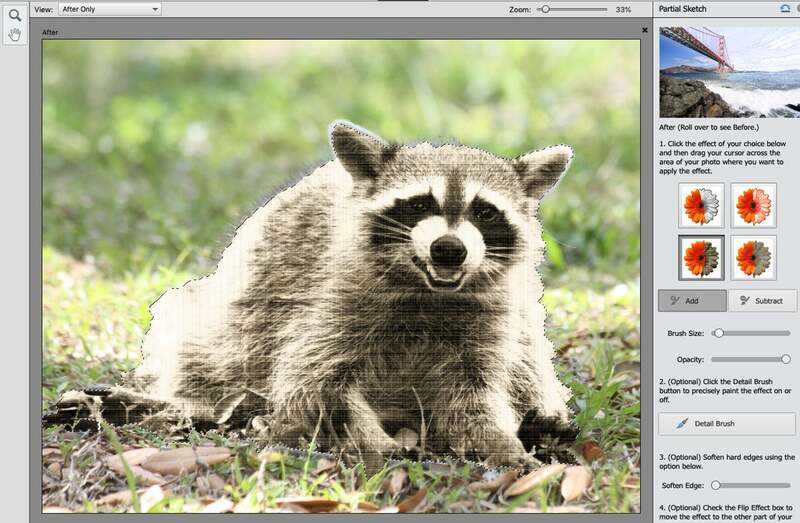 The updates for Photoshop Elements 2019 are relatively modest in terms of the number of new features. But quantity doesn’t always signify quality, especially with the kind of aggressive annual update schedule Adobe always adheres to for its consumer photo and video apps. 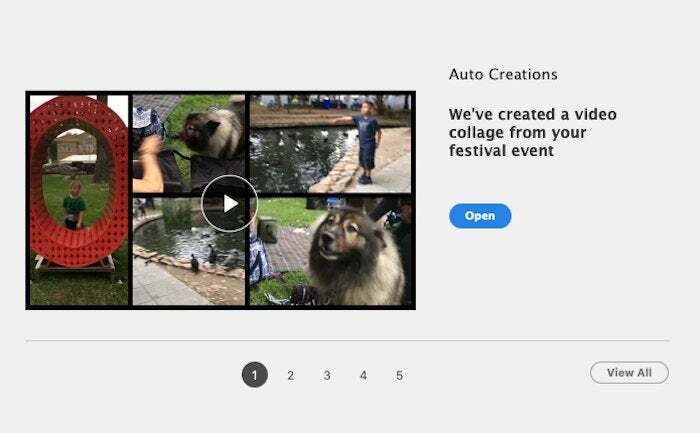 This year, with few updates to the Organizer and a respectable Home Screen, Adobe focused its Sensei AI engine to its best advantage to simplify and auto generate appealing photographic special effects and social media friendly collages, slideshows and memes. If you’ve been waiting for several years to update your Photoshop Elements app, now is a great time to do that. If you’ve upgraded more recently, you can probably afford to skip this version.